Dodders are parasitic plants belonging to the morning glory family, Convolvulaceae. They were formerly placed in the dodder family, Cuscutaceae, with only one genus in the family, Cuscuta. Depending on the reference, there are somewhere between 100 – 170 species worldwide with 13 species found in Ohio. The two most common species found in our state are Common Dodder (Swamp Dodder), C. gronovii, and Field Dodder, C. pentagona. Just how common are dodders in Ohio? I don't see them very often, but I welcome your input. Please be specific with pictures and exact locations. For example, I've been keeping track of what appears to be a single dodder species in the Otto Armleder Memorial Park, Great Parks of Hamilton County, 5057 Wooster Pike, Cincinnati, OH 45226. All of the images and observations in this report were made at that location. The hallmark of dodders are their thin, tendril-like stems that encircle the stems of their host plants. Dodder stems range in color from yellow to orange to red depending on the dodder species and age. Some, but not all species have tiny scale-like leaves. Although most dodders have some chlorophyll, it's insufficient to photosynthesize enough sugar to support a singular lifestyle. Mature dodder plants also lack roots. Dodders are obligate parasites; they can't make a living without their plant hosts. They invade their hosts using specialized, peg-like structures called haustoria (singular haustorium). The dodder's haustoria are considered modified roots and are used to extract water, carbohydrates, and nutrients from their host's vascular bundles. Of course, dodders do not start out looking like spent fishing line. They are annual flowering plants with each flower producing 2 – 4 large seeds depending on the species. Apparently, there is no obvious seed dispersal mechanism for the large dodder seeds. Infestations in field crops and landscapes are often associated with the movement of soil, equipment, or water. Indeed, dodders are often found along waterways and Armleder Park is located in the Little Miami River flood plain. The large dodder seeds are loaded with carbohydrate to support the frail seedlings until they can locate a plant victim. The seedlings produce a rudimentary root system, but if they don't sniff out a host to latch onto with 10 – 15 days, they die. I used "sniff out" deliberately because that's exactly what they do. Research published in Science in 2006 showed that dodder seedlings are capable of detecting plant volatiles released by prospective host plants. The sensory mechanism used by dodder is not known, nor are the exact chemicals or mixture of chemicals that send an "eat here" message. However, it was shown that dodder can distinguish between odors emitted by good hosts like tomato and non-hosts like wheat. Dodders are stealthy plant invaders using a move that's been described as mimicking a computer virus. Research published this year in Nature showed that dodders send microRNA into their hosts that silences the encoding of genes that would normally support defenses. One of those defenses is a protein that clots the flow of nutrients to the site of the dodder's haustoria. Without the "anticoagulant" protein, the plants life blood keeps flowing into the dodder. Dodder wreaks havoc on its plant hosts in other ways. The dodder bridge between several hosts can serve as a passageway for plant pathogens including viruses and phytoplasma. Plant stress caused by the heavy extraction of the host's resources can weaken plants making them even more susceptible to plant pathogens as well as environmental calamities such as drought. 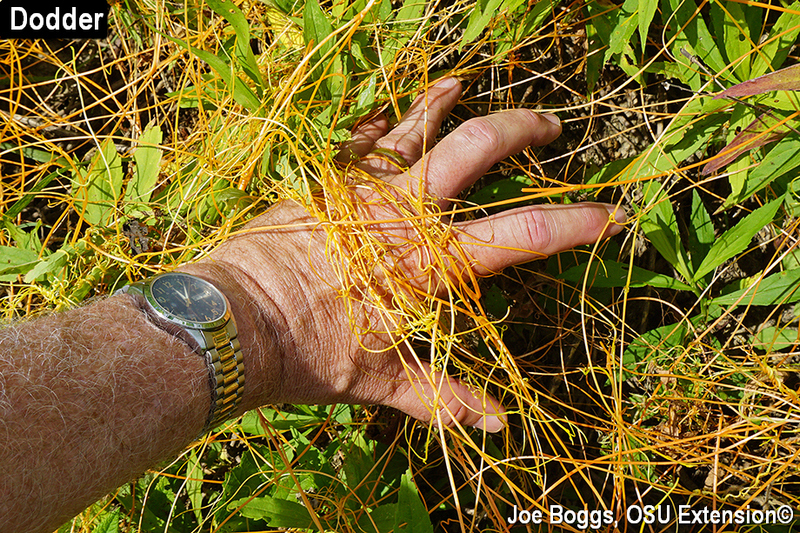 I may not see dodder as being widespread in Ohio; however, there is no doubt that dodder causes annual crop losses worldwide that are measured in tens of millions of dollars. These parasitic plants have been found sucking the life out of over 100 species of plants including alfalfa, clover, soybeans, and even solanaceous plants in gardens such as petunias and tomatoes. The annual life cycle of dodder starting with seed germination in the spring means dodder can be managed using a range of preemergent herbicides. This is a common and effective approach used to suppress dodder in field crops and ornamental nurseries. However, research published in 2008 in the journal Flora casts some doubt that dodder always has an annual life cycle. The researchers observed a possible perennial characteristic of clover dodder (C. epithymum) by overwintering vegetatively on its most common perennial host Scotch heather (Calluna vulgaris). I observed the possible harboring of dodder within the woody stems of black willow (Salix nigra) last fall. Dodder flowers were sprouting from woody nodules on the main stems. The flowers were free from any direct connections to dodder stems. I remain uncertain exactly what I was seeing and revisited the willows yesterday but could not find dodder tendrils emerging directly from the willow stems. However, I will be monitoring the trees this season. Dodders have some nefarious sounding common names such as wizard's net, devil's guts, hellbine, and witch's hair. However, they are not devoid of providing some benefits. Research published in 2017 in the Proceedings of the National Academy of Sciences showed that dodder's tangled threads can function as important lines of communication between connected plants. When a plant was attacked by defoliating caterpillars, messages sent to other plants connected on the dodder web caused them to raise their defenses. The caterpillars were less successful with attacking the pre-warned plants. Dodders also contains a range of compounds that may be beneficial in human medicine. They have long been used in Chinese folk medicine. A review published in 2017 in Biomedicine & Pharmacotherapy reported dodders harbor molecules with possible therapeutic benefits including potential antiviral and anticancer activities. Of course, some claims may be overblown. In preparing this report, I came across dodder facial cream that promises to reverse skin aging. I'm hoping to make a bulk purchase. NOTE: See "More Information" below for key selected research referenced in this report.